Castle Comfort Stairlifts offers top brand stairlifts, keen prices and fast installs for all those seeking stairlifts in Trowbridge, Wiltshire . And all work comes with our no-quibble guarantees and famous customer service satisfaction. Hello we’re still in Wiltshire on our Castle Comfort Stair Lifts’ blog tour! Did you know that people born and bred in Wiltshire are known as Moonrakers? The reason is down to legend: smugglers managed to foil local excise men by hiding their stash of smuggled alcohol in a village pond. To further conceal their contraband, they raked the pond causing ripples and told the official they were trying to rake in a large round cheese – in reality a reflection of the moon! The officials assumed they were ‘simple’ – read stupid – or mad locals and left them to it. 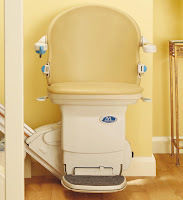 Castle Comfort Stair Lifts won’t think you’re simple if you ask questions about their product, and would rather you didn’t make assumptions, but let us explain! Take a look at our founder Keith’s short video which will probably tell you all or most of what you need to know. Check out which stairlifts we do and our comparisons of their qualities and prices and if you still have unanswered questions please give us a call on 01179 059 177 . Today we’ve come to Trowbridge, the County Town where Wiltshire County Council have their headquarters. The land where Trowbridge sits was farmed as long ago as 3,000 years, there is evidence that there was a settlement called Trubridge there at the time of the Doomsday Book when it was recorded that 100 residents lived here. They’ve come on a bit since then with a population of more than 28,000 making Trowbridge the third largest town in the county after Swindon and Salisbury. It was in the 13th century that Trowbridge began to grow by developing the woollen textile industry in the town. It flourished and grew becoming more industrialised by the 17th century and reaching its peak in the 18th century. By the mid 18th century Trowbridge had 2000 wool-producing factories comparable to towns in the north like Rochdale. It became known as the ‘Manchester of the West’. New ways of spinning saw the industry here begin to decline in the 19th century though. Only a few Mills remain; Trowbridge Museum which is integrated into a shopping centre now occupies Salter’s Mill which didn’t close until 1982; the County Court sits in what was Clark’s Mill and the Handle House where teasels were dried and stored to raise the nap of the cloth is still there. Another of Trowbridge’s claims to fame is that it is where the bedding industry developed and thrived initially using cast-off wool from the mills. Airsprung Furniture now Airsprung Group PLC were started here in the 19th century and are still based in the town. Another industry connection is Bowyers; Abraham Bowyer started producing sausages at the beginning of the 19th century and built up a thriving business. It was eventually bought out by Northern Foods and is now known as Pork Farms Bowyers. You can still buy Bowyers sausages and pork pies today. Brewing company Ushers of Trowbridge opened in the town in 1824 and continued to brew until closure in 2000 though there were several amalgamations and name changes along the way. Are you declining like the industries in Trowbridge? We’re sure you aren’t or at least with a little help from Castle Comfort Stair Lifts you certainly won’t feel that way. So if you’re looking for a stairlift look no further. 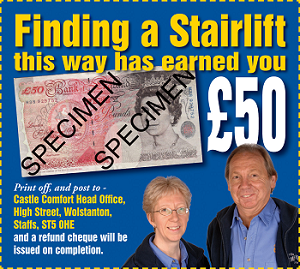 We can supply and install a stairlift for you at a fair price, in no time at all. In fact it takes our installation team usually about an hour to have you up and running or at most half a day. Giving you back the freedom to access your entire home. Bradford-on-Avon just 4 miles from Trowbridge is popular with tourists as it is full of historic buildings. Although Bradford-on-Avon has been there since Roman times, it also grew as a result of the woollen textile industry in the 17th century and still has several buildings dating from that period. The town grew up around a ford which crossed the River Avon; in Norman times a stone bridge was built over the ford and still stands today. On the bridge is a small domed building which was built as a chapel (now Grade I listed) but later used as a lock-up for misbehaving locals. Another historic building of note is St Laurence’s Church which is Saxon (700) with some restoration in the 10th century but has had no later alterations making it pretty unique. Just outside Westbury (6 miles from Trowbridge), an old hill-fort town like Salisbury you will find the Westbury White Horse originally carved into the chalk downs. Legend has it that the horse was carved in a slightly different form to celebrate King Alfred’s victory at the Battle of Edington back in the 9th century. · Famous people actually from Trowbridge are thin on the ground but there are plenty of famous faces from neighbouring towns! · Melksham (6 miles from Trowbridge) is home to Andy Park aka Mr Christmas. He has celebrated Christmas EVERY DAY since July 1993 except the officially recognised Christmas Day of 25th December. He claims to have eaten almost 4,500 roast turkeys and 87,600 mince pies and 4,380 bottles of sherry since he started continually celebrating – figures from 2006. In a local radio interview last year he says he is still celebrating Christmas every day. In 2001 his doctor warned him that his diet wasn’t good for him – he had reached 19 stone! A true Wiltshire Moonraker perhaps? Remember Castle Comfort Stair Lifts can accommodate weights even 19 stone – many up to 25 stone. We have a range of straight, curved or perch stairlifts; remember that curved stairlifts are more expensive because they are made to measure so that they ‘fit’ you perfectly. But you won’t find better prices because we are the national agents for all UK stairlift manufacturers which also means we will give you unbiased advice. Just pick up the phone and give us a call ( 01179 059 177 ) and let’s get you mobile again.